When we grocery shop, we toss household cleaning products into the cart without even thinking about it. We need them to keep our homes clean and sanitary, right? Every time we turn on the TV we are inundated with commercials touting one new product or another, but are all of these cleaners really necessary? It’s my belief that they are not. You’ve probably got all you need to keep your home spotless right there in your bathroom cabinet or kitchen cupboard. Here are some common household products that can be used effectively as cleaners for mere pennies a use. Toothpaste – You can, as Ripley famously said, believe it or not, but I get just as good a result using toothpaste to clean my ceramic cooktop as I do using the special cleaner made specifically for the job. In fact, I think the toothpaste works slightly better and you use it the same way. Simply put a small blob of toothpaste on the burner and use a damp Teflon-coated sponge to work it into the burned-on spots. Then rinse. Repeat as necessary. Both the pricy cleaner and the toothpaste take a little elbow grease but I’d rather pay a buck for a tube of dollar store toothpaste than $4 for a product like Cerama Bryte®. Vinegar – You may already have heard that white vinegar is a versatile cleaner and deodorizer. You can use a cup of vinegar in a gallon of hot water to mop your floors. I use a splash of vinegar in a bucket of hot water to wash my windows and then wipe them dry with an old tea towel. I get sparkling results every time. You can also dilute it half and half with water in a spray bottle to clean your mirrors. Here’s something else I can highly recommend. A cup of vinegar, run through a full cycle in an empty dishwasher, will remove gunk from the inner mechanisms and clean the interior. Never buy a special dishwasher cleaner again. Clean your kettle by boiling vinegar and water in it, then wipe away the residue and rinse thoroughly. Clean the coffee maker by running vinegar through the brewing cycle. Then run two or three cycles of water through to rinse. Please note that vinegar cannot be used to clean those one-cup-at-a-time coffee makers like Keurig or Tassimo. More’s the pity. Lemons and lemon juice – Disinfect a wooden cutting board by running a slice of lemon over the surface. Clean copper and brass objects with a cut lemon sprinkled with salt. Adding a half cup of lemon juice to a regular-sized load of white laundry will help to brighten it. Mix equal parts of water and lemon juice in a spray bottle for a do-it-yourself air freshener. Scrubbing kitchen and bathroom taps with a lemon juice soaked cleaning cloth will remove hard water deposits. Baking Soda – I’ve had some success unclogging drains with a combination of baking soda and vinegar. Pour one half to one cup of baking soda down the drain and slowly pour the same amount of white vinegar after it. Let stand for about five minutes then pour boiling water down the drain. This is best used as a preventative measure once a month to avoid blockages in the first place but, if you do get a clog, always try the eco-friendly option first before inflicting those harsh chemical drain openers on the environment. You can also use baking soda just as you would a powdered cleanser like Comet to clean your bathroom and kitchen sinks. Baking soda is also good for removing crayon, pencil, ink and furniture scuffs from painted surfaces. Sprinkle a little on a damp sponge, rub clean and rinse. You can clean up minor oil and grease spills on the garage floor or driveway by sprinkling baking soda on the offending spot and scrubbing with a wet brush. Olive Oil – Shine stainless steel without fear of dulling or corrosion by using olive oil instead of ammonia. Olive oil makes a great alternative to sprays for dusting your wooden furniture. Simply add a bit of oil to a cloth and wipe. Some sources suggest mixing one part lemon juice with two parts olive oil to make your own furniture polish. Any leftover polish made this way would need to be refrigerated. 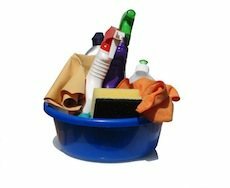 You’re supposed to believe you’re getting a superior clean by buying manufactured cleaning products, but it isn’t necessarily so and using what you already have on hand will save you a bucketful of money, too. My parents have been using white vinegar to clean their window for years. Defiantly some good tips here. Great list. Vinegar and baking soda seem to be miracle products!